Being a charter captain in Maine is the greatest job in the world. It’s that simple. What other job allows you to consistently serve people who are having the time of their lives, on the water, in one of the most beautiful places in the world? I’ll answer that for you. There is no other job that compares. Becoming a charter captain is not easy. You need experience, confidence, good health, expertise, and the ability to entertain the people who pay you for what you do. You must acquire and maintain licenses, insurances, CPR status, drug consortium memberships, an emergency towing company membership and of course, you must keep up with ever-changing regulations that rule your industry, both state and federal. And then there’s your boat. It needs to be cleaned, mechanically maintained, constantly inspected for safety issues, stocked with whatever it is you use to entertain clients including, but not limited to fishing gear, bait, lobstering gear, sailing gear, sightseeing gear, and then you HAVE to have life jackets, lines, fire extinguishers, flares, first-aid kits, throwable life-preservers, radios and backup radios, electronics, radars, snacks, soft drinks, an extra everything-a-client-might-forget-but-need (sunglasses, sunscreen, hat, bug repellant, etc), a tow line, a selection of sharp knives, a cutting board, a camera and your cell phone. Oh, and you also have to run your charter business. And you can fail at none of these things at any given time because the happiness and most importantly safety of the souls on board your boat depend upon your doing it right every single time without question, no excuses. 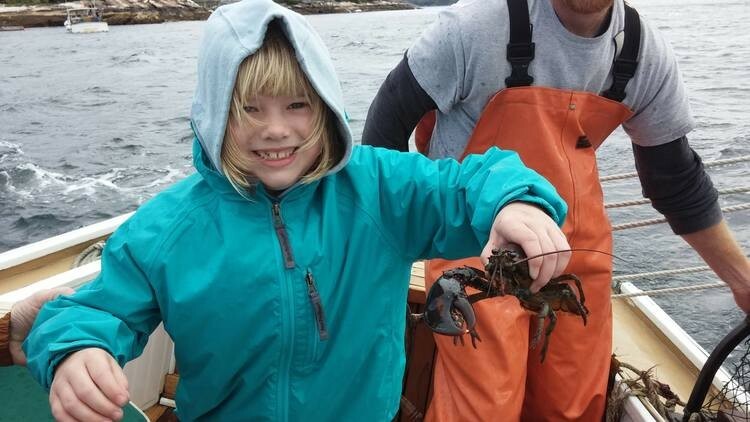 Even with all of it, when you, our precious client, step off the dock onto our boats, and we see the wonder, the excitement and the sheer joy of you and your family getting to really experience the incredible coast of Maine from our boat, and when we push off that dock, and when we, as your guide for the day, your captain, when we look around us, you better believe it’s very, very simple for us. Being a charter captain in Maine is the greatest job in the world. And we can’t wait to have you share it with us.